Well we finally made it to Prince Rupert. 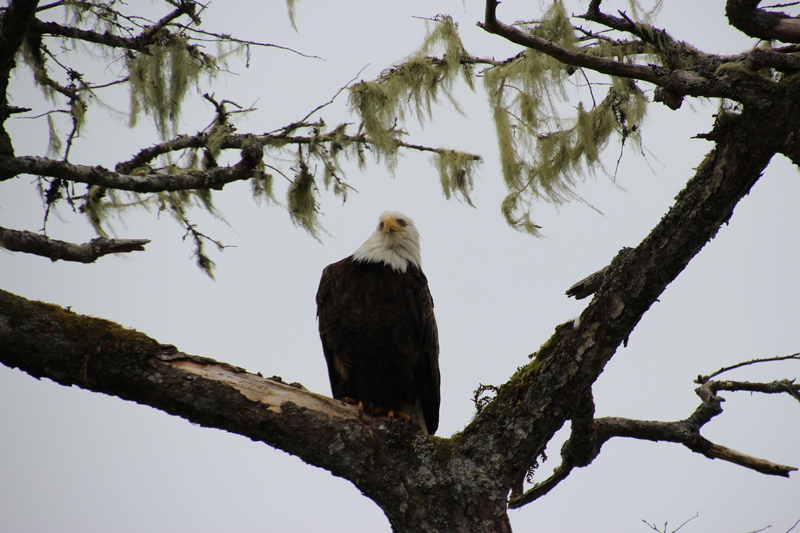 Two more days and we will be in Ketchikan. 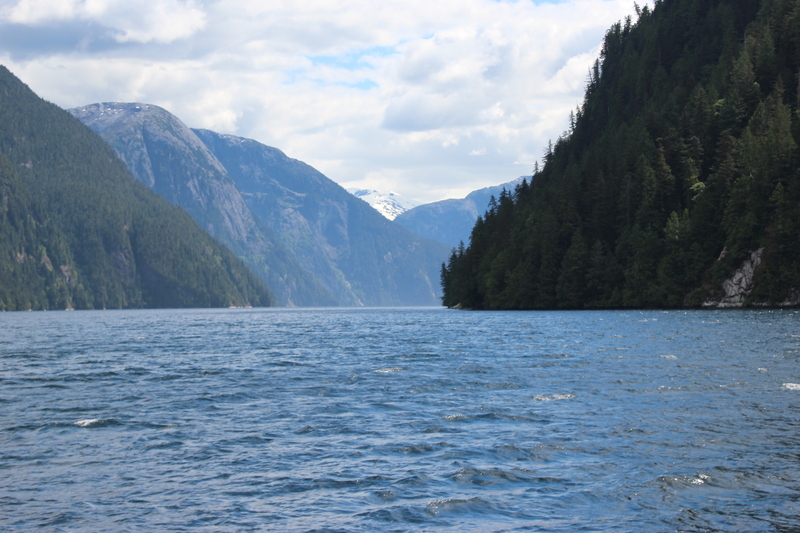 It has been a long week since leaving Port McNeill and crossing Queen Charlotte Sound which took us 4 hours at 3-5 ft swells at 4 sec. For anyone that does not know how bad that is trust me it was not fun. The pilot house looked like a cyclone went through it. We rocked and rolled for a long time. The boat can handle it but we don’t want to go through that again. Bailey could not even stand up the cat slept through it all. We found we need to do a better job of tying things and storing things so they don’t move around. Glasses clattered in the cabinets, and things shifted. 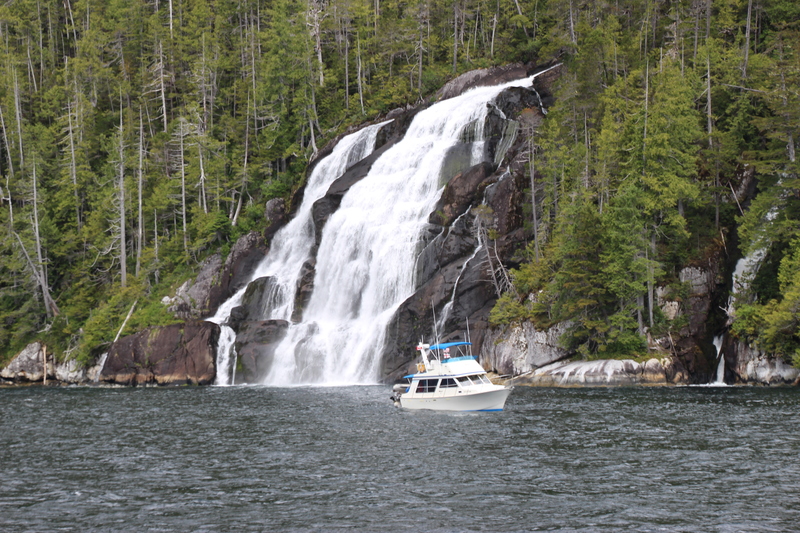 We ended up in Fury Cove anchored and then on to Ocean Falls which was a very interesting town. This town use to have 5000 people now maybe 100. It was a complete ghost town where everyone just up and left. It was very eerie. It was a Crown Zellerbach paper plant that closed and everyone just left the town. Hotels, apartment buildings and homes, all just setting there empty. Walked through some of the houses and they are or were nice houses, just empty. Then onward to Shearwater where we stayed for 2 days. 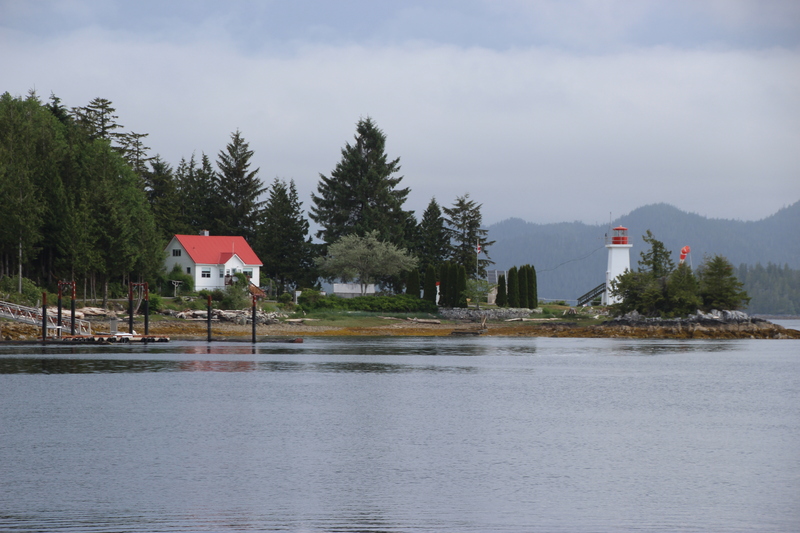 We took a water taxi to the town of Bella Bella and walked around. Bella Bella is inhabited by the local Indians. We walked around, they all were so friendly. Would ask us if we were tourists. We learned the greeting is “Yo”, they loved it! We just can’t believe that people live out here in nowhere land. 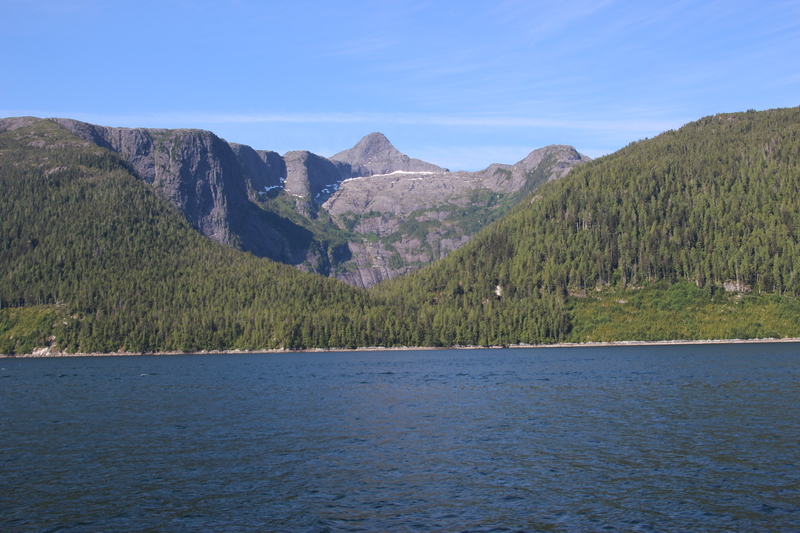 Next on to Rescue Bay, Windy Bay, Bishop Bay, Lowe Inlet where we anchored. Lowe Inlet was the worst anchorage last night. We had gale winds of 30 mph and we had to wait up for the tide to go out to see if we had enough water under the hull. Tides here are 12 to 16 feet. So the world looks pretty different around you when you wake up in the morning, from what it looked like when you went to bed. Needless to say we did not sleep very well. Rescue Bay was full of seals. They were very curious and would pop their heads up when we were motoring around on the dinghy to see what we were doing. On our way into Bishop Bay we had porpoises lead us in for about an hour which was really cool. They road our wake and under the bow of the boat playing all the way. Pretty cool. 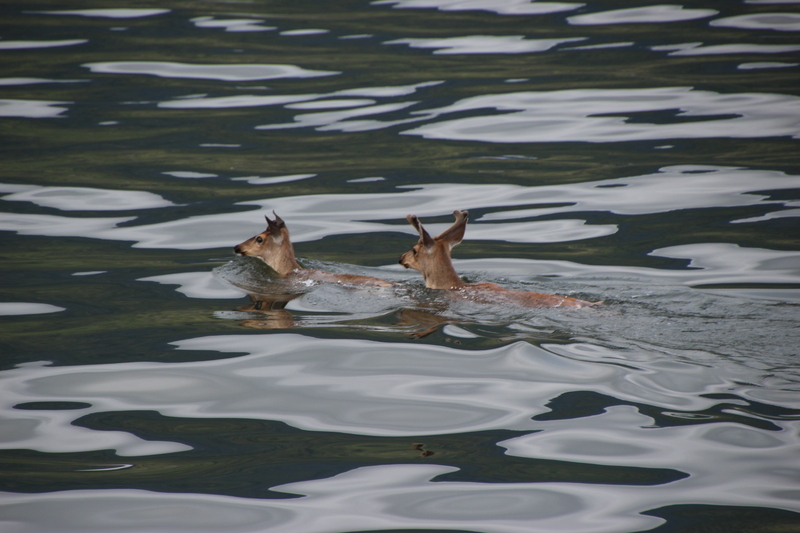 We also have not seen any bears or whales but did see a buck and doe swimming across the Grenville Channel today. It’s a mile and a half wide!! Hope they made it across. Bailey had to learn again how to go the bathroom on the boat since we have been anchored for the last 4 days. I think she might finally have it. How to use her fake grass. Well need to quit for the night, up at 4:30 crossing tomorrow morning. This is open sea so it could get rough. so early start. The scenery has been absolutely beautiful. We were anchored in a bay and looking at all the tall mountains around us and said, I”ll bet there a places here no one has every walked. No one. It is so far from anywhere. It is so nice to finally get back to some civilization. Pictures will be downloaded to our photo gallery as soon as I have more then a few hours. Service is so slow……. We will post more pictures on the link in our gallery. Well, we just saw this post! Get the bad weather over before we get there! Miss you!